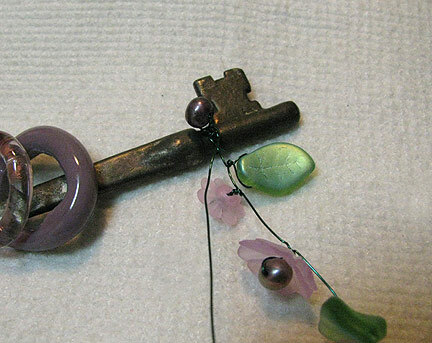 The first part of this tutorial was posted last week, and covers how to make the lampwork rings around the antique skeleton keys. 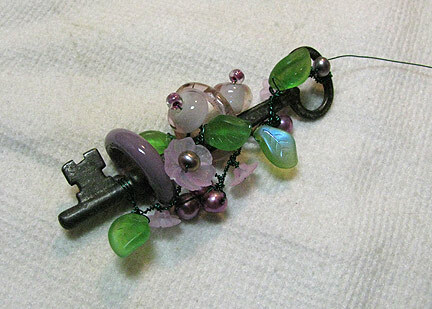 If you don't do lampwork or don't have any antique keys, you can find some reproduction keys and interesting metal rings that might do the trick at the links. 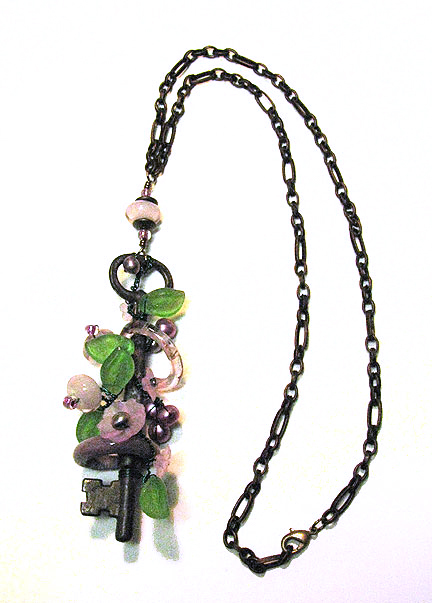 Today we're going to look at how to add the rest of the decorative beads and turn the key into a wearable pendant. 1. 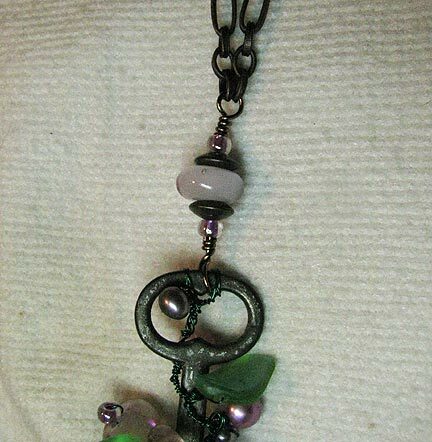 Using the 28 gauge craft wire, add flowers, leaves, and bead clusters until you have a piece about 4 to 5 inches long. Space the beads about 1/3 to 1/2 inch apart along the wire. Detailed step-by-step instructions for making wired pieces are in the 4th chapter of my e-book, Every Bead Has a Story. 2. Wrap the long end of the wire around the bottom of the key and anchor it well. Use the long end to wrap back along the entire length of the wired piece to strengthen and thicken the "stem". 3. Spiral the wire stem upward and around the shaft of the key, looping it over the lampwork rings. Wrap the wire end around the top of the key to end and snip off any leftover wire. 4. Using a 4 inch piece of bronze wire, create a connector piece with two wrapped loops that will attach the key to two pieces of bronze chain. I used a few more of my lampwork beads for this, along with two raw brass discs. 5. Add a jump ring and a lobster claw clasp to the other ends of the chain. Thanks for continuing this tute! I'm enjoying it! I really love this necklace, Cyndi. The pendant is very special and you've combined it with just the perfect chain to best display it. This necklace is just wonderful Cyndi! I love the antique key.